You can compile an Excel spreadsheet into an EXE application with securely protected formulas in binary format and protected VBA code. In order to protect your workbook algorithms from being copied, we have developed our own formula calculation engine. This calculation engine substitutes Excel’s original calculation in the compiled EXE, while the Excel itself is used for formatting and reflection of calculation results. This is the only way to truly protect your workbook algorithms. With the registration/license management feature you can protect your compiled workbook from being illegally copied from one computer to another through the use of the hardware locking mechanism. Try the free trial version of XCell Compiler! It comes complete with all of the features for formula and VBA protection. Protect spreadsheet formulas by converting them into binary format. Without this feature, any kind of Excel file copy protection is useless. Compile Excel workbook (XLS, XLSX, XLSM, XLSB files) into an application (EXE File, which requires Excel to run). You do not need to be a programmer to use the product! VBA code protection. VBA copy protection blocks access to the VBA project (as it makes VBA project unviewable), and hides the VBA code, thereby disabling VBA debug mode. By applying the VBA code modification options, such as ‘Obfuscation’ and ‘Literals Removing’, you will get modified VBA code, which will not work outside of the compiled application. Compile workbook into an EXE that is compatible with both 32 bit and 64 bit Excel versions. All versions from Microsoft Excel 2003 SP3 and higher (Excel 2007, 2010, 2013, 2016, 2019) are supported. Microsoft Excel as a part of Office 365 is supported. Customize or localize (translate the language to your customer’s native language) the compiled workbook messages. Run a compiled workbook without a macro security alert. Create a registration key/license based application, preventing it from being illegally copied from one computer to another. Workbook copy protection with hardware locking! This allows your protected workbook to work only on the targeted computer. Royalty-free distribution of your compiled EXE, which doesn’t require any pre-installed run-time libraries. Workbook copy protection with a hardware dongle (USB stick). The original Excel workbook remains unchanged after compilation. Restrict the time period of the usage for your protected workbook. Add your own End User License Agreement (EULA) . The compiled Excel workbook will not be started until the end user accepts the EULA. Save changed data directly into the compiled EXE file or into secured external data storage. Create a Trial/Demo version of your protected workbook with adjustable trial period and custom “nag” window. Create installer package for your protected Excel spreadsheet by using our freeware product – DoneEx Installer Maker. Quantity discount offer! 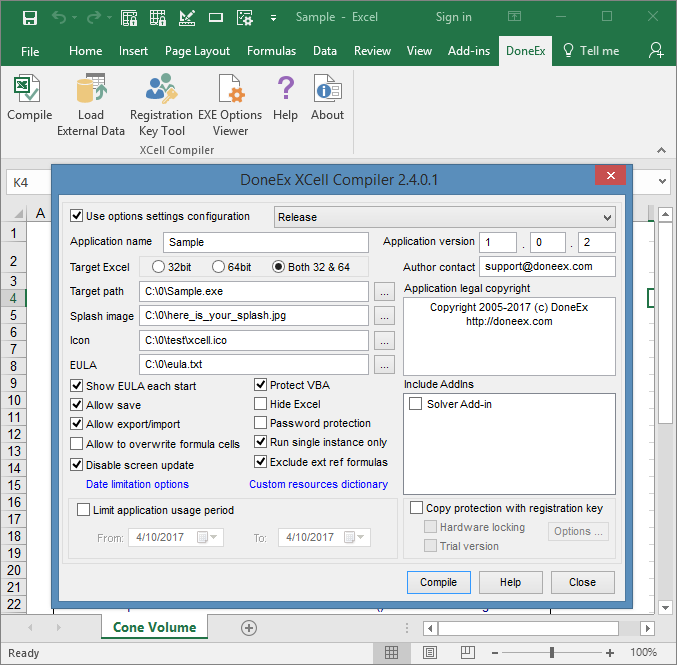 Each DoneEx XCell Compiler Business PRO License – 33 % OFF , if ordered 2 or more at the same time! Use it immediately OR reserve the licenses for future use!